Perfect for wraps, sandwiches, crackers, etc. WrawPs are healthy for you in every way! We are 100% vegan, raw, gluten-free, paleo, organic, wheat-free, low in fat, all natural, a superfood, high in fiber and more! Our company motto is “Love Your Body” and we have made a product that follows through on that promise. You get three large 7.5" x 10" Wraps per pack. Suggested use is 1/2 wrap per sandwich, so you get about 6 servings per pack. 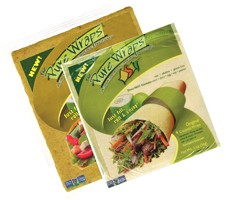 You can enjoy WrawP without weighing down your body with grains and carbs and all of the other stuff that traditional bread does to your beloved body. Since we dehydrate our flatbread, all of the nutrition, enzymes and every bit of flavor of the fruits, vegetables, and seasoning are still there to love and benefit your body. All of the vitamins, minerals, and ayurvedic spices packed into one sheet of WrawP will help you to build your strong immune system. WrawPs are TASTY and VERY PLIABLE. For best quality, use within 3-months when stored at room temperature. Refrigeration will extend freshness of the product.